#SmallSuccess Thursday: Writing and Homeschool and Snow! Welcome to CatholicMom.com’s Small Success Thursday, where we cheer each other on for the little things that go right in life. Be sure to check out the other Small Success posts at CatholicMom.com and at the #SmallSuccess hashtag on social media. I haven’t really participated in Small Success Thursday for the last month (or even blogged a lot), despite the fact that I had writing ideas enough to blog nearly every day in December. I got sick just before the Third Sunday of Advent, and I barely got any Christmas decorations up at all. In fact, my kids did most of what decorating was done, and I barely dragged myself through the week. I recovered enough to do some Christmas preparations about three days before Christmas, and packed in baking several batches of cookies, wrapping ALL the presents, and tidying up a little bit. Writing was one of the last things on my mind, at least on the blog. Which brings me to my first success, and it’s not actually small. I finished writing a manuscript for a book that I felt specifically called by God to write. I have sent copies of the manuscript to some friends who know what they’re doing (some of whom have been published on dead trees, even!) for feedback. I sent a copy to my mom, too, but she’s too biased to really pick it apart. 🙂 I know there’s work to be done on it, and I’ve been praying for humility (Yikes! Did I really say that?) as I wait for feedback from other people. But I’m convinced it’ll be published eventually. We’re also keeping up relatively well with school, even though it’s been crazy with church and soccer and dance and my 17 year-old’s job. And despite me being sick, the kids worked well enough independently that I didn’t despair when I looked over the lesson plans after Christmas was over! I’m grateful that they kept themselves largely on track. Southwest Virginia is supposed to get slammed with snow tomorrow. I’m not freaking out, and I managed to get stocked up well before the storm. I’m obsessed with keeping up with the weather, and I saw that we were definitely getting some snow, possibly half a foot, on Monday. So I shopped THEN for the majority of what I needed, including bottled water. (We’re on a well, so if we lose power, we lose water.) I’ve spent the rest of the week picking up odds and ends to prepare for the weekend, but it’s mainly been things I forgot I needed for a recipe here or there. I realized today that I kind of need more puppy food, so I’ll grab that when I go out. If this storm is as bad as they think, we might get two feet of snow! As you can see from the pictures above, we had a light dusting last night. I should have some really pretty pictures up on Instagram (Christine_CatholicMomVA) tomorrow. I can’t wait to see what Frodo Waggins does with that much snow! One last success, which I nearly forgot! In the last month, Frodo Waggins has learned how to lay down on the floor and take a nap when he’s tired! No more forcing him into the kennel to sleep during the day when he’s tired. He just lays on the floor and crashes out! And, since his surgery (because he’s 7 1/2 months old, you know), he’s also learned to sleep outside the kennel at night! Last night, Mr. Frodo slept in our bedroom doorway. It was so sweet. We’ve really only had to resort to the kennel when we go out (because he does get into things) and if he’s over-tired and freaking out. Then we put him in bed with a biscuit and close the door and let him calm down. It’s like a time out for puppies. So Frodo is turning into a Really Good Dog. Huzzah! What are your Small Successes this week? 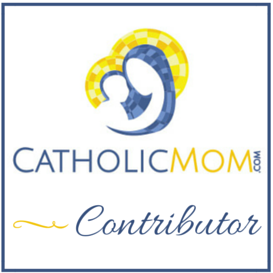 Share in my comments below, or head to CatholicMom.com and link up with your own blog post! I am in Cincinnati and they too cancelled the Buses to DC. While we are on the edge, the storm is sitting right over the path home.